The other day when I picked my twins up after school, they weren’t digging my music on the car radio. One of them immediately said “Alexa, change the song…” before realizing she didn’t work in our car. To say my kids are loving Alexa is an understatement. 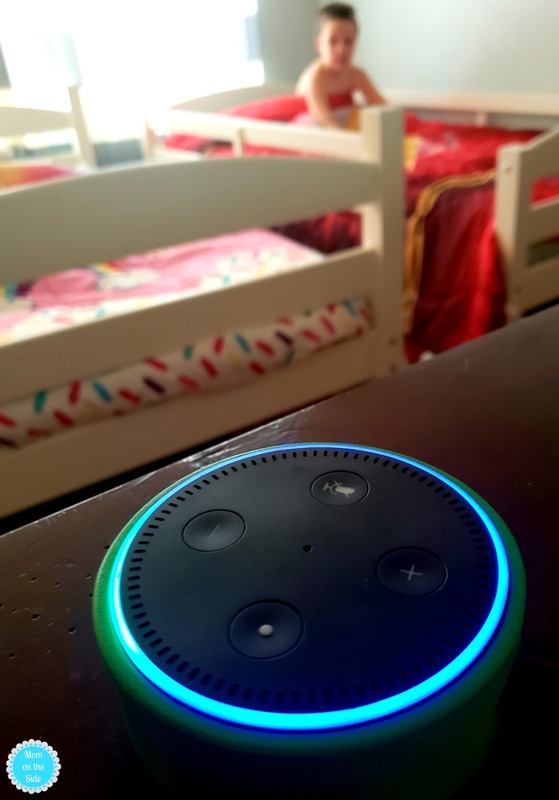 She gets lots of questions and a whole lot of use with the Alexa Routines our family uses on Echo Dot Kids Edition every day. 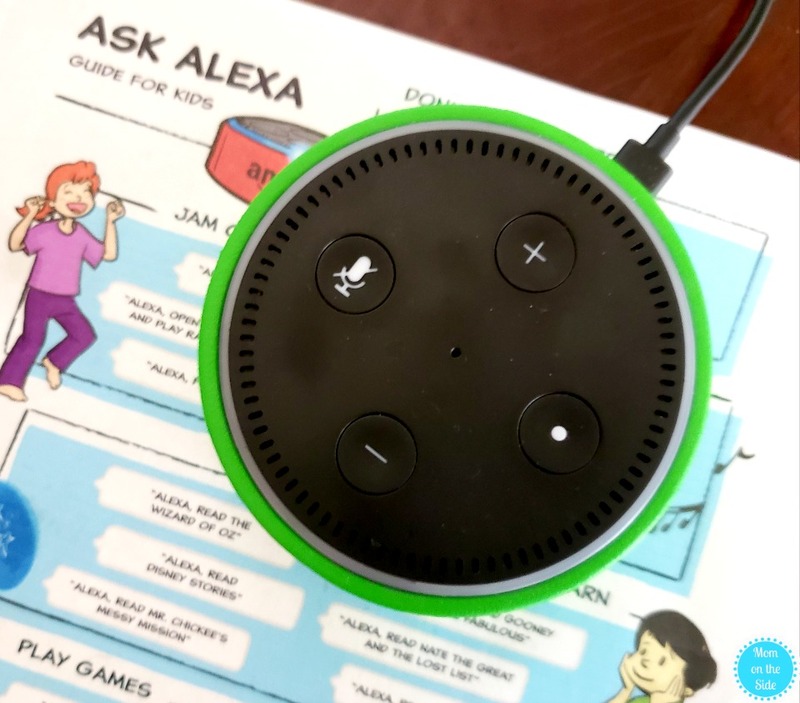 With lots of great features like over 1000 Audible kids’ books and world-class parental controls, Echo Dot Kids Edition with FreeTime on Alexa help manage, entertain, and educate with a simple question. We use Alexa to manage daily routines, answer off the wall questions by 6-year-olds, and fill our living room with dance parties. Take a look at a normal day in our house with Alexa, starting with our morning routine. About a week ago the twins asked for an alarm clock in their room. Apparently, mommy’s beautiful singing voice saying “wakey wakey eggs and bakey” wasn’t appreciated anymore. It’s cool, but only because I didn’t have to go out and drop money on an alarm clock. Thanks, Alexa! If I could have woken up entertained each morning through character alarms from Disney, Nickelodeon, and Cartoon Network I probably would have asked my mom to stop waking me up too. There are ALL different kinds of alarms to choose from including Rapunzel, Moana, Spongebob, and Olaf. You can easily set alarms via the Alexa App on your phone. 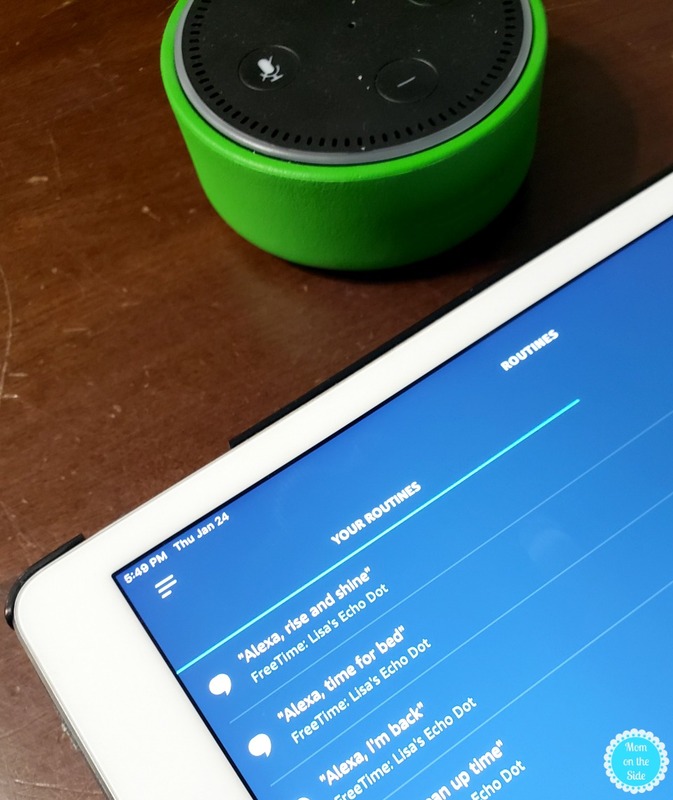 I set-up a morning routine using Freetime on Alexa for the Echo Dot Kids Edition and I’m loving it! You can also set that up through the Alexa App, and all I have to say is “Alexa, rise and shine” to initiate the routine. Alexa starts the day with a fun fact followed by the weather. My twins are in kindergarten so they love having Alexa share the weather since it’s one of the first things their teacher asks at school each morning. After the weather, Alexa plays kids songs on iHeartRadio to help get the twins moving and dressed for school. I’ve also set-up an after school routine on our Echo Dot Kids Edition with FreeTime on Alexa. Usually, the twins play outside after school but on cold snowy winter days that isn’t an option. When they come home from school on those days, they can say “Alexa, I’m back!” and she welcomes the kids home with fun facts, jokes, and music. One of my FAVORITE Alexa routines is for cleaning up! I simply say “Alexa, clean up time” and she gives the kids an encouraging cleaning message followed by music to get them moving and picking up. I use it a lot before dinner time and on Sunday nights. If you need a way to get the kids to get clean give this a try! Bedtime Alexa routines might be my second favorite. My twins have always been a struggle at bedtime. They never want to go to bed and ask for a million things once they are there. Our current bedtime routine with Alexa offers a good variety of sleep-inducing tactics which are cutting down on the whining. After getting drinks (so they can’t ask once get in their room) and a trip to the bathroom, I simply say “Alexa, time for bed” and our routine begins. I’ve set-up this Alexa routine to start with a bedtime story. After storytime is a little kid-friendly meditation and finally, lullabies or sleep sounds depending on the night. 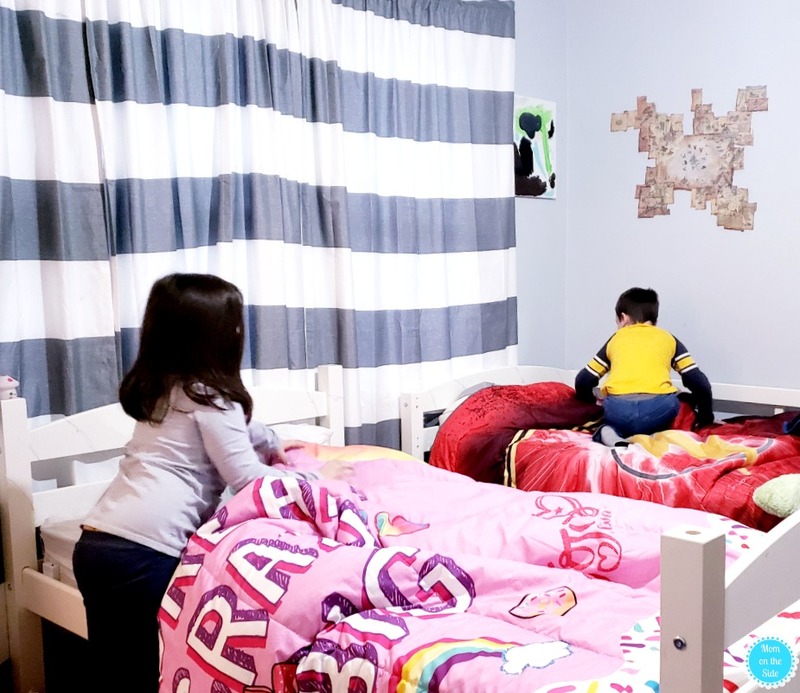 Having the Echo Dot Kids Edition in the twins bedroom really helped them get back on a sleep schedule after the holiday break from school. Because it’s in their room, I use the world-class parent controls in Amazon FreeTime to choose when it shuts down and turns on so the twins can’t use it when they should be sleeping. Bonus points for that feature! Really, all the parental controls are top-notch on Echo Dot Kids Edition with FreeTime on Alexa. As the parent, I choose which services and skills the kids can use by enabling or disabling them on the device. Explicit song lyrics with Amazon Music can also be blocked to ensure kids are listening to appropriate music. Echo Dot Kids Edition and FreeTime on Alexa are making life easier in our house. 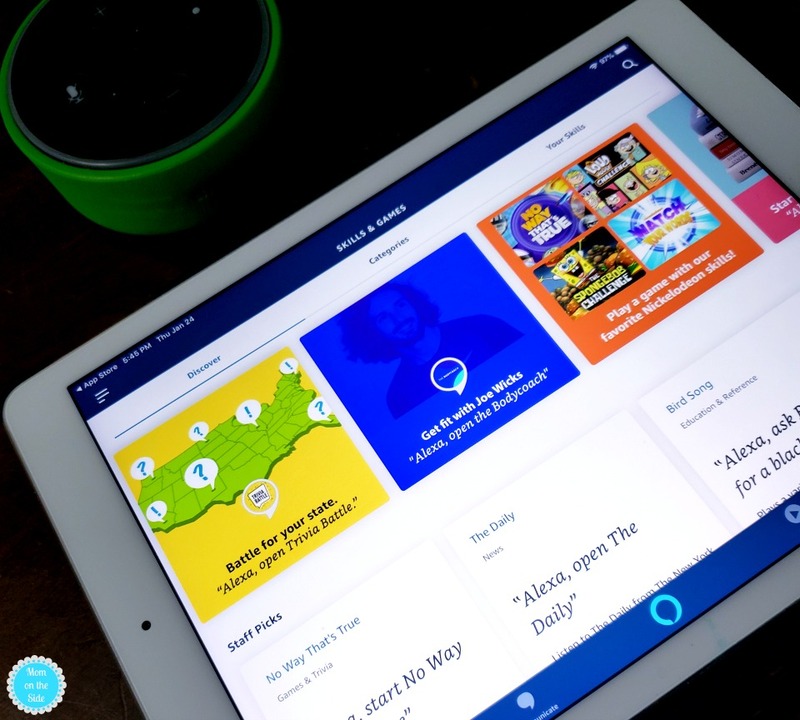 I’m still learning all the fun ways to use her and I’ll keep sharing how we are using our Echo Dot Kids Edition to manage, organize, and entertain. Check out this smart home device if you haven’t yet, which also includes a whole year of FreeTime Unlimited, a kid-friendly case, and 2-year worry-free guarantee! Learn more about Echo and Alexa at Amazon.com!